How Curious: Where Is Oklahoma’s Southwest Corner? Highway 62, west of Hollis in southwest Oklahoma. George Bogaski is trying to walk the entire perimeter of Oklahoma, about 1,450 miles. Bogaski estimates he’s hiked about 25 percent of the total distance, and he has a tradition of smoking a cigar at each of the state’s corners. He’s lit up at all of the others--but could not find the state’s southwest corner. He asked How Curious: Where is the corner? Is there a marker? “I smoked a cigar close to what I thought was the [southwest] corner. But if I didn’t, that cigar was wasted,” Bogaski said. 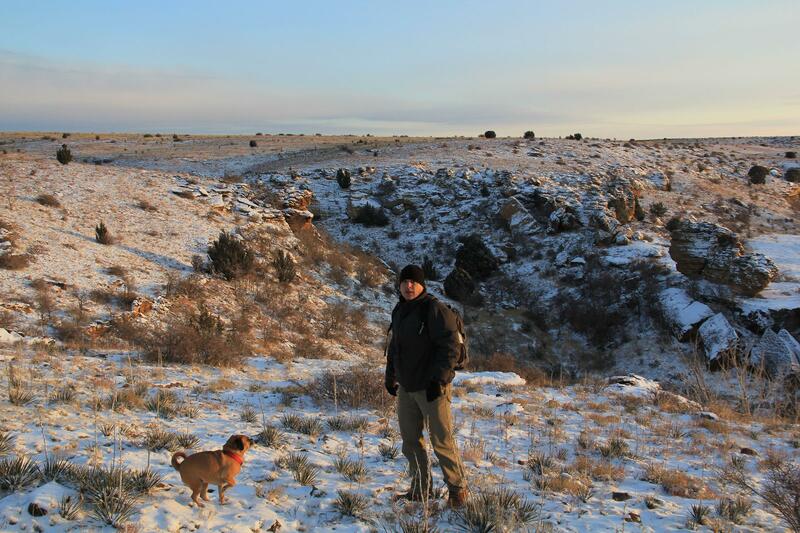 Bogaski has been on this unusual mission for about a decade, hiking hundreds of miles, admiring the state’s geography and wildlife, from the Rita Blanca National Grasslands to the shortleaf pine trees in southeast Oklahoma. George Bogaski and his dog Daisy on a hike. Bogaski is trying to walk the entire perimeter of Oklahoma, about 1,450 miles. Most of Oklahoma’s border is relatively straight, except for the southern boundary, which is formed by the Red River. The flowing water separating Oklahoma from Texas has caused territorial disputes for centuries. “Rivers have this interesting thing--they move,” said Carl Tyson, author of The Red River in Southwestern History. The 1819 Adams-Onís Treaty, negotiated by Secretary of State John Quincy Adams and Spanish Minister to the United States Luis de Onís, set the Red River as the dividing line between the U.S. and Spanish territory. At the time, Spain owned the land that became Texas and Mexico, and the United States had claimed much of what is now Oklahoma. According to Tyson, neither country had extensively surveyed the land. “There are some 18th and 19th century treaties where they talk about, ‘[The territory] will go to a certain point on this river,’ and it turns out...the river doesn’t go there. They were just guessing,” Tyson said. When surveyors mapped the land more than 30 years later, Tyson said they discovered the Red River forked just south of modern day Frederick, Oklahoma. Texas and the U.S. government each claimed the land in between. The U.S. Supreme Court ruled in favor of the federal government in United States v. Texas in 1896, but border disputes continued even after Texas and Oklahoma became states. In 1923, the Supreme Court established the river’s south bank as the Oklahoma-Texas border. Oklahoma enacted the Red River Boundary Compact in 1999, a federally-approved agreement with Texas that further defined the border as “the visually identifiable, continuous line of vegetation” along the river’s south bank. “I would guess that there’s not been a year since 1890 in which there was not some conflict between the state of Oklahoma and the state of Texas over where the river was and where the river is now,” Tyson said. The Red River is shown south of Hollis, Oklahoma. The south bank of the river marks the boundary between Oklahoma and Texas. Where Is The Southwest Corner? Davey Edwards is a registered land surveyor for Texas and Oklahoma. “If you follow the south bank of the Red River as described in the 1923 Supreme Court decision, and you get to the 100th Meridian, that’s the southwest corner of Oklahoma,” Edwards said. Congress sets state boundaries, working with involved state legislatures. Legislators can also commission surveys and monuments to mark those borders, according to United States Geological Survey Cartographic Technician Patrick Wilson. Many organizations, like utility companies, the Army Corps of Engineers, the USGS and the National Geodetic Survey use markers to survey land. USGS and National Geodetic Survey markers, usually brass disks set in concrete, assist surveyors in triangulation, or using a network of triangles to determine distance and relative positions of points in a region. They also help surveyors create topographic maps. “[The markers] have a coordinate value on them, so when you get near one or two, you can tie them in and you know where you are on the earth,” said Edwards. Edwards said the ever-changing course of the Red River likely washed away any markers placed at the southwest corner. The Geodetic Survey’s database shows four markers near Oklahoma’s southwest corner, one of which references an old Oklahoma-Texas boundary marker, a gray stone with a cross cut in top. I recently traveled to Harmon County, Oklahoma in search of the southwest marker. It was a warm, sunny day when I pulled up to Tricia Bartlett’s property, a white house with a big wooden porch on E. 1670 Rd. Bartlett said she didn’t know whether there is a marker on her land, but strongly advised me against venturing into tall grass to look for it because of rattlesnakes. “Not without boots, particularly near the river. Particularly not a warm day...You’ll get bit,” said David Cummins, a Hollis resident I met while looking for a second opinion at a local diner. Another resident, Bill Dill, said he killed 68 rattlesnakes last year. I decided not to risk a rattlesnake bite so I can’t say for certain whether there’s a southwest corner marker, but I plan to go back with boots when there are fewer rattlesnakes. A Daughters of the American Revolution marker on Highway 62 notes the 100th Meridian, the western boundary of Oklahoma, excluding the panhandle. How Curious is a production of KGOU Radio. It’s produced by Claire Donnelly and this episode was edited by Caroline Halter. David Graey composed the theme music. Email your questions about Oklahoma to curious@kgou.org. Subscribe to the How Curious podcast on iTunes or your favorite podcast app. How Curious: Did Louis L’Amour Live In Oklahoma? Western author Louis L’Amour is said to have lived in Choctaw, Oklahoma during the 1930s and 1940s. One listener wanted to know if the rumor is true, and, if so, where exactly was his home? How Curious: Where Were Oklahoma’s Green Book Listings? The Green Book was a guide for African Americans traveling during segregation. It listed businesses that did not discriminate on the basis of race. KGOU listener Luciana Simmons asked How Curious: Where were Oklahoma’s Green Book entries? Do they still exist? How Curious: Why Are There No Oklahoma City QuikTrips? KGOU listener Nick Jungman heard a rumor that an old agreement between business owners is keeping the Oklahoma-based QuikTrip out of the state’s capital city. He asked How Curious: Is this story true?